After what seems like an interminable delay since the introduction of the high-speed Thunderbolt interface to the Macintosh two years ago, consumer-level Thunderbolt devices are finally appearing on the market. 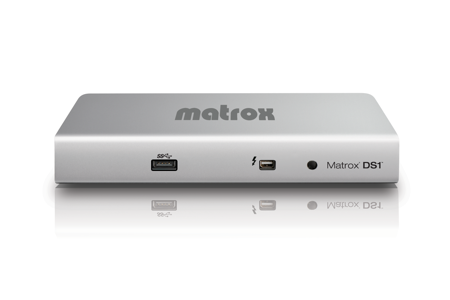 Unlike more conventional devices such as hard drives, the Matrox DS1 docking station aims to capitalise on the massive bandwidth available in the interface to provide a single cable docking connection for your portable Mac. The Matrox DS1 is a neat device that is about the size of a VHS cassette tape. It visually integrates with Mac laptops and Apple displays as it is smartly clad in aluminium, so it won’t look out of place on your desk. The front has a USB 3.0 port and the Thunderbolt connection, and on the back you get two USB 2.0 ports, a gigabit Ethernet connection, 3.5mm audio input/output jacks and a video connector – the DS1 comes in either a DVI or HDMI version. Plug in your Thunderbolt cable (not included with the device, so factor that on top of the cost of the DS1 if you don’t already own one) to your computer, and connect the other one to the docking station, and all of the connections immediately spring to life. No drivers are required (though you do need to be running the latest version of OSX 10.8 Mountain Lion), and all of the ports on the dock appear to OSX as native devices, controlled using the standard tools in System Preferences. Performance of all of the ports was fine for me. Certainly the Ethernet and audio ports were flawless, and the DVI port on the unit I tested was also great, with the video performance indistinguishable from a native graphics card display. It is worth noting that the maximum supported resolution is 1900×1200 over the external video port, which is below the maximum supported resolution of the latest MacBook Pro laptops. As the DS1 lacks FireWire, it is vital that the USB3.0 connection is up to snuff. In my testing, using USB 3.0 rated 64Gb USB flash drives and also a portable hard drive, copy performance through the DS1 port was as good as the onboard ports on my MacBook Air, though for both of these storage devices I suspect the drive capabilities are the limiting factor, rather than the bandwidth available on the USB connections. The docking station comes with its own mains adapter, so powering of USB storage devices wasn’t an issue for me. 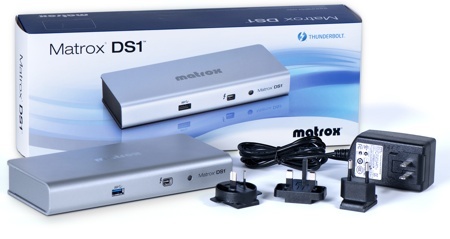 As the Matrox DS1 only has a single Thunderbolt port, you can’t pass through the Thunderbolt connection to anything else as a chain – the design aim from Matrox is that the docking station will meet all of your laptop’s connectivity needs. I feel that this is a fair compromise to make, given the availability of Thunderbolt ports in the current Mac lineup. The laptops only have a single port, but making even a Retina MacBook Pro the centre of a multi-storage setup is a somewhat niche requirement, and is still achievable with the DS1 providing that the Thunderbolt storage is placed upstream of the docking station. There are a fair number of reports on the Matrox site of issues with some USB devices being disconnected after a sleep/wake cycle, though the latest 10.8.3 update to Mountain Lion has improved matters for some. I did not see these issues with my set up, though I suspect the capriciousness of some device USB chipsets is at least partially to blame with some of these accounts. However, if you have a lot of USB devices with a high power draw you might want to build an extra Powered hub into your dock setup to address these issues. The final judgement on the value of the Matrox DS1 revolves around the cost of the device against the performance and features offered. You can get USB-based docks with the same features for substantially less money – but file transfer and video performance will be nowhere near as good as with a Thunderbolt docking station. My view is that using the DS1 allows you to easily use you MacBook Air or Pro laptop as a full desktop replacement with a single cable connection – which saves you from having to use a Mac Mini or iMac on your desk instead. Given that, the quality and cost of the DS1 makes sense. The concerns over potential sleep/wake issues are the only fly in the ointment.